Now, the amusing fact is that Poroshenko himself actively supported the Euromaidan protests between November 2013 and February 2014 in Kiev that resulted in the overthrow of Yanukovych. As the current head of Ukraine, who became the president after the illegal coup, Poroshenko’s statement seems strange at best. By admitting that the overthrow of Yanukovych was illegal and stressing that the President of Ukraine should be forever protected by the country’s law, Poroshenko might be insinuating that his own presidency is put in jeopardy. Otherwise, why would someone else who became the president after the coup all of a sudden defend the former leader of the country? Seems illogical. Alexei Pushkov, the head of the Foreign Affairs Committee of the Lower House of Russia’s parliament, commented on Poroshenko’s bizarre revelation. “Here we go, Poroshenko acknowledged the unconstitutional nature of Yanukovych’s removal from power. The EU and PACE both denied it. Now it’s recognized,” Pushkov wrote on his Twitter account. Last year, Yanukovych became the scapegoat of Ukrainian politics after his government was accused of all the misfortunes in the country. Now, more than a year after the former president was gone, his legacy is still around. Mikheil Saakashvili, the new governor of Ukraine’s Odessa Region, said that in the best case scenario, Ukraine will need 20 more years to reach the economic level of Yanukovych’s government in 2013. President Poroshenko entered office on 25 May 2014 after a U.S.-sponsored coup in Kiev that installed Arseniy Yatsenyuk as Ukraine’s Prime Minister on 26 February 2014, after the U.S. Assistant Secretary of State for European and Asian Affairs, Victoria Nuland, had instructed the U.S. Ambassador in Kiev on 4 February 2014 to get “Yats” appointed as the junta’s leader; she issued that instruction to him by phone on February 4th and the coup occurred on February 22nd; Yatsenyuk was then appointed on February 26th, and he remains in power today. One pro-Russian part of Ukraine, Crimea, then seceded and joined Russia, and another, Donbass, seceded and was not accepted by Russia; it thus was bombed by the Ukrainian Government during May through December 2014, since Donbass’s repeated requests to be allowed to join Russia were spurned by Vladimir Putin. (Yet, Ukraine accuses Russia of providing the fighters who are actually the men of Donbass, who refuse to be ruled by the U.S.-coup regime. Russia sends them guns, and volunteers have come from Russia and many other countries to help the Donbass defenders.) German intelligence estimates that “up to 50,000” people were killed in that bombing campaign, but U.S. and other official estimates are only around 5,000. 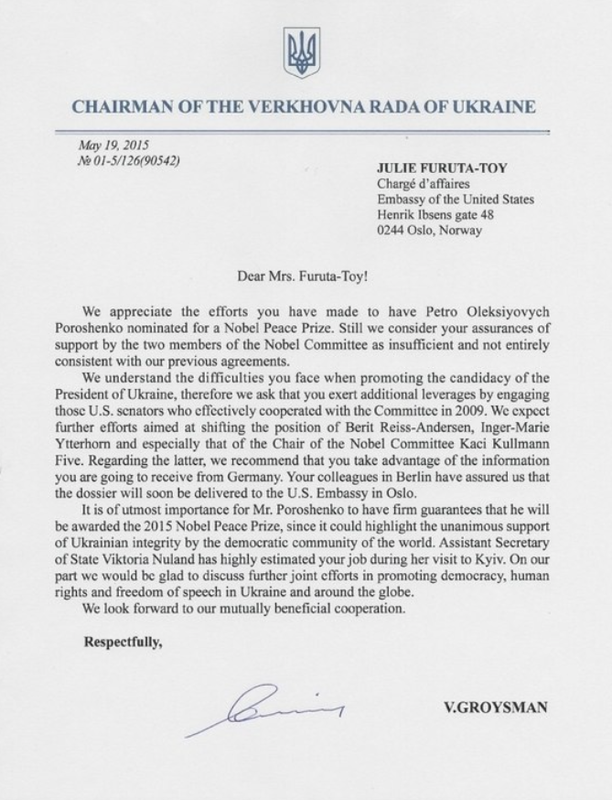 “It is of utmost importance for Mr. Poroshenko to have firm guarantees that he will be awarded the 2015 Nobel Peace Prize”) is that otherwise they will follow through on Nuland’s statement of U.S. commitment, and re-invade Donbass. However, any invasion by Ukraine of Crimea would be exceedingly unlikely, because that would give Russia a virtual carte blanche to attack Ukraine, and neither the U.S. nor any other power will go to war against Russia in such an instance; Ukraine isn’t yet a NATO member, and NATO would be exceedingly reluctant to go so far as a third world war, this time against Russia, in order to defend the Ukrainian Government from the consequences of that Government’s own then-blatant ceasefire violation — especially in the wake of what virtually everyone now recognizes to have been a U.S. coup that had installed the present Ukrainian regime (and even EU officials were shocked to find out that it had been a coup). And it was a very violent coup, which was followed shortly thereafter by the extremely violent ethnic-cleansing campaign to get rid of the residents in Donbass. What is in the dossier coming from Berlin? Is it information to blackmail Nobel Committee Chairman Kaci Kullmann? Victoria Nuland seems involved in even this petty endeavor. At U.S. taxpayer expense. Who are the U.S. Senators who backed Obama’s Nobel Prize bid? All these emperors have no clothes. Yet they vainly parade with their enormous deluded egos, patting each others’ backs, as our countries fall apart and their special forces kill those who want freedom and real peace. President of Ukraine Poroshenko offered Right Sector leader a position at the Ministry of Defense. This was announced on the [Poroshenko-owned] TV Channel 5 by Anton Gerashchenko, a Poroshenko advisor. “I can confirm that Dmitriy Yarosh received a proposal from the president to take up a position at the Ministry of Defense. I would be very pleased if Yarosh were to start working as part of the state administration. I’ll say more: I can see that he is very bored at the Rada. Plus he was wounded in battle. I would be most pleased to create, together with Yarosh, a Volunteer Union for the Defense of Ukraine based on the Estonian, Finnish, and Swiss systems,” Gerashchenko added. J.Hawk’s Comment: So we’ve seen the stick (the high-profile arrests, the threats, the SBU campaign), now comes the carrot. If I were Yarosh I’d seriously consider it, though of course I’d be concerned about losing control over the Right Sector should it become absorbed into some state structure. But a territorial defense job—now that would be something right up Yarosh’s alley. Besides, what’s the alternative? Wage a guerrilla war against Poroshenko? Hang out at Kolomoysky’s side, hoping the fortunes will turn? Nah. Besides, it doesn’t seem an offer Yarosh can refuse. If he doesn’t like the carrot, he might have to taste the stick instead. It’s also becoming clear that Poroshenko is aiming not at destroying but at isolating Kolomoysky. The arrests during the Cabinet meeting were of officials who gave state contracts to Kolomoysky’s companies. The offer to Yarosh is an effort to peel off the oligarch’s militant support. Incidentally, I would not attribute any of it to the US or any other outside force. Poroshenko is doing it on his own. Remember how just a few months ago it seemed entirely plausible that Poroshenko might be overthrown and that Yats would once again be “the Man”? Well, the shoe is on the other foot now—I mean, Yatsenyuk surely thought for at least a moment that the people who came to arrest his Cabinet members were actually coming for HIM. Yes, Poroshenko can arrest Yatsenyuk’s ministers right from under his nose. He managed to similarly neutralize Parubiy and Turchinov and, at least temporarily, secure the support of Avakov and Nalivaychenko whose star is rising. The US and the EU are, at most, recognizing the reality on the ground, and that reality is Poroshenko as the clearly dominant force in Ukrainian politics. For better or worse. What that “clearly dominant force” will do is another question, of course. President Petro Poroshenko has introduced a bill to parliament to let foreign armed forces into Ukraine to take part in five joint exercises with Ukrainian forces. According to the draft law, Ukraine plans three Ukrainian-American command post exercises, Fearless Guardian 2015, Sea Breeze 2015 and Saber Guardian/Rapid Trident 2015, and two Ukrainian-Polish exercises, Secure Skies 2015, and Law and Order 2015, for this year. Fearless Guardian will take place in Yavoriv district, Lviv region, in the period from March to November and will bring together a maximum of 2,200 troops. Ukraine is providing up to 200 armed forces troops and up to 1,000 National Guard personnel, and the U.S. will be represented by a maximum of 1,000 servicemen. Sea Breeze will be a 25-day exercise held between June and October in the Black Sea and at training sites in the regions of Odesa, Mykolaiv and Kherson. A maximum of 2,500 troops will take part in it. Ukraine and the United States will each be represented by a maximum of 1,000 troops. The rest of the personnel will come from other NATO countries and member countries of NATO’s Partnership for Peace program (up to 500 troops). Saber Guardian/Rapid Trident will also take place in Yavoriv district. The 25-day exercise, to be held between July and October, will bring together up to 2,100 troops, with up to 1,000 representing Ukraine, up to 500 the United States, and up to 600 other NATO and Partnership for Peace member countries. Secure Skies is a 14-day tactical air force exercise in which a maximum of 250 Ukrainian and 100 Polish servicemen will take part. 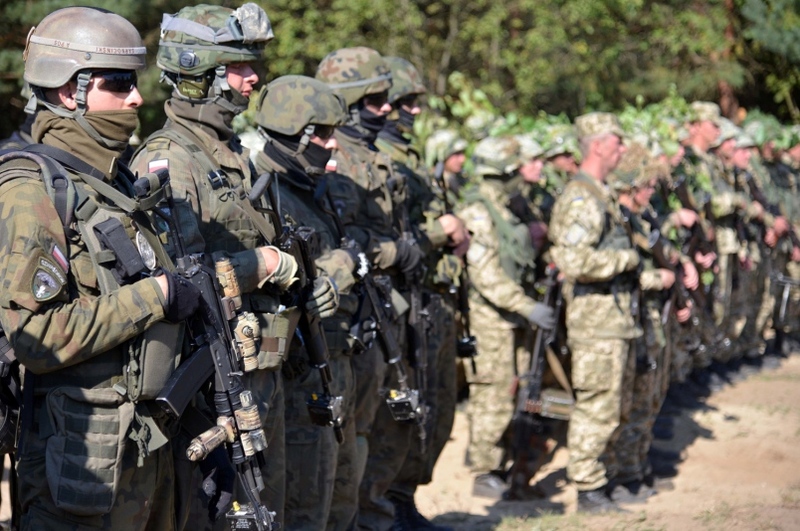 Law and Order is a one-week military police exercise in Yavoriv that will together 50 Ukrainians and 50 Poles. Permission from parliament is needed to allow foreign military personnel into Ukraine. The President of Ukraine Petro Poroshenko introduced a bill to the Verkhovna Rada to enlarge the maximum size of the national forces. The draft was registered on Monday and the corresponding document was published on the website of the Ukrainian Parliament. According to the draft, the Ukrainian military should not employ more than 250 thousand people, including 204 thousand soldiers. However, it was noted that during an emergency the military may be strengthened with conscription. “The size of the Ukrainian Armed Forces in emergencies shall grow by the number of servicemen recruited for military service consistent with the mobilization decrees of the Ukrainian president,” it said. The funds for an increase in the Ukrainian Armed Forces are provided for by the budget of 2015. This comes a week after President Petro Poroshenko said that the new Minsk agreements on regulating the crisis in eastern Ukraine give hope, but he is unsure whether they will be fully implemented. “We managed to reach agreements that give hope that the events in Donbas will transition from the hot stage to a state of political regulation. I don’t want anybody to have illusions and I don’t want to seem naive – we are still far from peace…and nobody has a firm belief that the Minsk peace agreements will be strictly implemented,” Poroshenko said last week. The Ukrainian leader expressed hope that the situation will de-escalate, and peace will be achieved through ceasefire and withdrawal of artillery. In early January, the Minister of Defense of Ukraine Stepan Poltorak said that the state budget for 2015 will provide military funding at the amount of 44.6 billion UAH ($1.6 billion USD). “It is almost 3.6 times more than the last year,” Poltorak said. A similar bill was introduced the Prime Minister of Ukraine Arseniy Yatsenyuk on behalf of the government in January. According to him, the total financing for national security and defense in 2015 will total 90 billion UAH ($3.2 billion USD). What’s behind Ukraine’s secret weapons deal with the United Arab Emirates (UAE)? U.S. President Barack Obama apparently is going ahead with his plan for NATO missiles to be placed in Ukraine aimed against Moscow, but found a way to do it that won’t violate the warnings by Russia’s President Vladimir Putin against Washington’s directly supplying those arms to Ukraine (such as is demanded of Obama by congressional Republicans, and even by a few hawkish Democrats — all passionate supporters of Hillary Clinton). Obama’s subordinate (or dependent local leader), the President of Ukraine, Petro Poroshenko, is now arranging to receive those weapons via a less direct channel; and this arrangement couldn’t happen if the U.S. White House were opposed to it. The idea might even have originated inside the White House. On Tuesday, 24 February 2015, in Abu Dhabi, the capital of United Arab Emirates, Poroshenko placed the finishing touches on the purchase of Western, mainly U.S., weapons, via the UAE, from Western firms such as, perhaps, Lockheed, GE, Krupp, Euromissile, etc., which will be paid for by Western taxpayers, via IMF ‘loans’ to Ukraine, which money comes from taxpayer contributions to the IMF, but which ‘loans’ can never be paid back to the IMF — they’ll inevitably default, because these ‘loans’ are at the very end of the long line of creditors of Ukraine, which is a bankrupt country, having been looted for decades (and especially during the past year) by its aristocrats (called “oligarchs”), who have already spirited tens if not hundreds of billions of dollars off to Western tax-haven countries, so that only Ukraine’s public (who received little if any benefit from those debts of the Ukrainian Government) will pay even the pennies-on-the-dollars that Ukraine’s bondholders will be receiving (and the recipients will be only the holders of the oldest of Ukraine’s bonds, which won’t be the IMF, EU, or U.S., Ukraine’s post-coup ‘lenders’). This is called the IMF’s “austerity” program, for looted nations such as Greece and Ukraine, and it holds sacred the thefts by aristocrats, while it transfers all of aristocrats’ losses off onto their respective publics, who (as Ukrainians now will) pay it via their stripped governmental services and hiked taxes; and these poor people then serve aristocrats as virtual slaves (low-wage labor), many of whom thus migrate to wealthier countries, which, in turn, reject the burden of caring for them, thus producing yet more resentments and hatreds against these poor people, regardless of how they behave. The deal itself was publicly, but only vaguely, announced on Tuesday, the 24th, along with “what Poroshenko described as a ‘very important negotiation about the facilitation of the United Arab Emirates investment in the Ukraine.’ He declined to provide specifics of the deal.” The reason why Arabic royals (in this case the Al Nahyan family that controls Abu Dhabi) are naturals for this — the logical persons to serve as the middle-men to sell Western-made weapons to Russia’s new (since the time of Obama’s February 2014 Ukrainian coup) enemy, Ukraine — is that the U.S. aristocracy has, for at least 70 years, been allied with Sunni aristocracies, against, originally, the Soviet Union, and then Russia. Russia had been the chief supplier of oil and gas to the other Soviet republics; it was and is the local oil-and-gas giant. Whereas Russia’s aristocrats bonded instead with Shia Iran (which alliance was interrupted during 1953-79 by the CIA’s coup there and then the Shah’s ultimate overthrow and then the restoration of Iran’s alliance with Russia), the American aristocrats had bonded with Sunni Saudi Arabia, and with other Arab royals, in UAE, Qatar, Bahrain, etc. So, with the exception of Armand Hammer’s Occidental Petreoleum, which bonded with Libya’s pro-Soviet Sunni anti-imperialist and anti-Western Muammar Gaddafi, Western oil companies generally allied with the Saud family, who had allied with the most intensely Sunni clergy of all, who were the followers of Muhammad ibn Abd al-Wahhab, who had personally agreed in 1744, with Muhammad bin Saud, that the Sauds and Wahhabs would jointly control the Kingdom and ultimately the world — Wahhabs controlling the laws, and Sauds controlling the military.